If you have lost your natural teeth you may be interested in getting dentures. The dental team at Plantation Dental Associates is experienced in creating stable, comfortable & well-fitting dentures to meet your individual needs. Dentures are removable prosthetic devices designed to fit your mouth and are custom made for you. A full denture, also called a complete denture, replaces all of the natural teeth and provides support for cheeks and lips. By replacing missing teeth, dentures not only support sagging facial muscles, completely changing the aesthetics of the face, but they also and improve the ability to eat and speak. Call Plantation Dental Associates today to schedule a consultation with our dentists. After a thorough examination they can discuss your options and help you restore aesthetics and functionality to your smile! 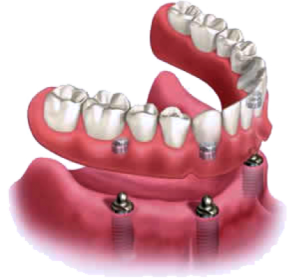 Implant-supported dentures are dentures that are attached securely to dental implants for added comfort and stability. We offer both removable implant-supported dentures that you can easily take out for cleaning, and fixed implant-supported dentures that are even more stable. A removable partial denture fills in the space created by missing teeth and fills out your smile. 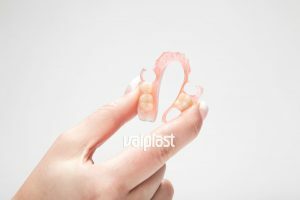 It usually consist of replacement teeth attached to pink or gum-colored plastic bases, which are connected by a metal framework, and attaches to your natural teeth with metal clasps or precision attachments. Precision attachments are nearly invisible, but often require crowns on your natural teeth for a precise fit and generally cost more than those with metal clasps. We do relines and most repairs right in our office lab. Scheduled appoints for relines take about an hour. We recommend using dental implants to stabilize your dentures. The more implants used, the greater the stability. With several implants per arch we can even do away with the upper palate material that covers the roof of the mouth improving the ability to taste food, reduce gag reflex and, for some, improves the ability to speak or sing. Contact us today to set an appointment to review your options for comfortable, stable dentures.